Little Knitters are learning to knit in colors. The Flaming Red Knit Slipper range from Red to shades of Orange and Yellow as the flames get hotter and hotter. Enjoy the Little Knitters version of their flaming hot Knit Slipper ~ Great Comfort with no seams on the heels or toes, a very unique knit pattern! Click Here is see a View of the Little Knitter enjoying the slippers that she is knitting! Shaped heel and toe for better fit! Tie Cording for slight adjustments of fit! Size: Toddler, Preschool, Small, Medium, Large, or XLarge - Choose Size under Options Below: Only the sizes available will be listed in the OPTIONS. Price varies with Size. This is a 'beginner level pattern' using stockinette stitches. The Knitting Machine Version has been written for Bulky Knitting Machines, but this is easily knit on Mid gauge knitting machines as well, following the same pattern, just a different stitch dial setting. Sharon has even knit this pattern on standard gauge and passap knitting machines, on every other needle, but care must be used to use the claw weights properly on standard gauge knitting machines. Read the pattern for hints and tips in all cases! Sharon even gives you several yarn choices to pick from: worsted weight yarns, acrylic / nylon blends, or cotton. 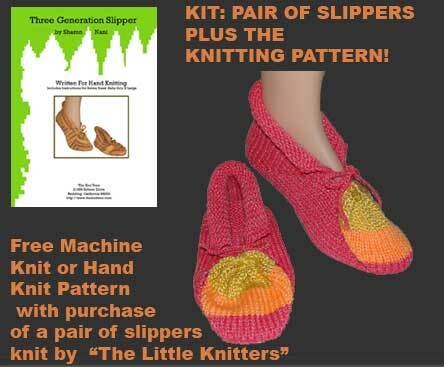 Yarn is not included in this kit ~ just pair of slippers and the instructions for the 7 sizes. and just a Great way to Pamper Yourself! Submitted by Emailed in Review on Fri, 08/09/2013 - 20:07.